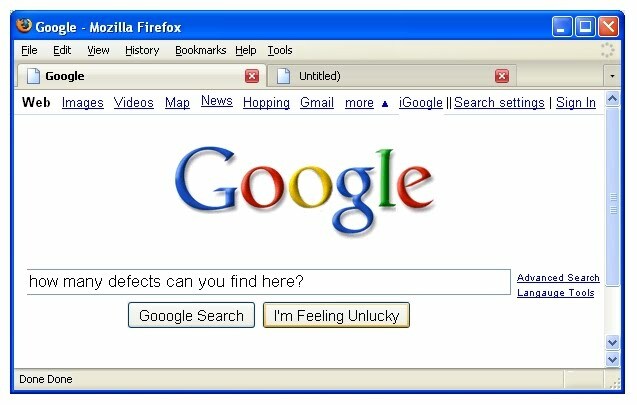 Can you find more than 20 defects in the below image? Write your defects in the comments section. Interviewer: What do you do when you are asked to start performance testing on a web application. Candidate: First of all, I try to understand the application, its main functionalities, its architecture and technologies used. Of course, this information will be given by developers. We will also need developers to help in the later stages of performance testing. After that, I normally follow 5 steps to do performance testing. The first step is to identify the performance test environment. The good rule of thumb is that our test environment should be exactly similar to the production environment. But in many organizations, this could not be the situation due to cost. So we try to create an environment which is as close to production as possible. The Test environment could be a Virtual machine in which we can increase or decrease the RAM and processing power when needed. Network Limitations, Hardware Configurations, Load Generation Tool, Logging mechanism, Licensing constraints etc. We do need the help of Network/IT team in designing the test environment. The second and most important step is to identify the performance acceptance criteria. This will be provided by business analysts, product owners who understand the business side of the application. If acceptance criteria are not clearly defined, the whole performance testing activity will become haphazard and inconclusive. Interviewer: So can you give some examples of some performance acceptance criteria? For example, Response times for all business operations during normal and peak load should not exceed 6 seconds. For example, the system must support 25 book orders per second. For example, No server should have sustained processor utilization above 80 percent under any anticipated load or No single requested report is permitted to lock more than 20 MB of RAM and 15-percent processor utilization on the Data Cube Server. There could be any number of performance acceptance criteria, but they should all be quantifiable and correlate to user satisfaction. Interviewer: Good. You mention throughput, can you define what is it? calls per day or any other number per unit time. The higher the throughput, the higher the performance of the server is. Interviewer: Great. So what if we don't have any idea for user expectation. What strategy should we use? Candidate: You can just ask the user that what performance you are expecting? Interviewer: (Laughing...) no no. I meant to say that suppose we are building a product and until now we don't have any user for that product because we have not launched that product. So how would we define the performance criteria for that? Candidate: In that case you should follow benchmarking or baselining. Interviewer: What is benchmarking and baselining? Candidate: Benchmark tests are the process of comparing the performance of your system against industry standards given by other organizations. One example of benchmarking is that you can see how your competitor's application performance is. Another example is that you can read the research papers from top performance engineers and see what they propose for ideal benchmarks for your domain. Baseline, on the other hand, is a comparison with your previous releases. You can set one particular release as your baseline. All future releases performances will be compared to that baseline. If results of any release are much degraded from the baseline that means something is wrong with the performance. if any release is performing better, you can change your baseline and set this release as your baseline. Interviewer: Good Answer. So what is the next step after identifying performance acceptance criteria? Candidate: Next step is to design tests. When designing tests, we should identify key usage scenarios, determining appropriate variability across users, identifying and generating test data and specifying the metrics to be collected. And High visibility usage scenarios. Interviewer: What other considerations you should follow while designing tests? Candidate: When we design realistic test scenarios, we should incorporate realistic simulations of user delays and think times which are crucial to the accuracy of the test. Secondly, we should not allow the tool capabilities to influence our test design decisions. Better tests almost always result from designing tests on the assumption that they can be executed. After that, we should see that what tool can do. Thirdly we should involve the developers and network administrators in the process of determining which metrics are likely to add value and which method best integrates the capturing of those metrics into the test. For example, if we want to know the CPU utilization, we should take help from network administrators that how we would capture CPU utilization in our test. Interviewer: Good. So up till now, we have discussed 3 steps while starting performance testing. Up till 3rd step, what do you feel some biggest challenges are? Candidate: I think the biggest challenge is to correctly identify the performance acceptance criteria. I cannot force enough is to how important this step is and how important is that for every stakeholder to involve in this step. Developers, Testers, Product Managers, Network Engineer and Performance Engineers they all should be part of this decision. The second biggest challenge is getting our first relatively realistic test implemented with users generally being simulated in such a way that the application under test cannot legitimately tell the difference between the simulated users and real users. This takes significantly longer time and again input from all stakeholders is very necessary for this step. Interviewer: Right. I agree. So what is the next step? Candidate: Next 2 steps are remaining. Execution of the tests and Analysis of results. Interviewer: Hello Mr. Tester. How are you? Candidate: Hello Sir, Thank you for asking. I am really good. How are you? Interviewer: I am fine. Thanks. Did you find the office conveniently? Candidate: Yes sir, address was elaborated very clearly and the map helped a lot. Interviewer: Great. What would you like to drink? Coffee, Tea? Candidate: Sir a glass of water will be fine. Interviewer: So Mr. Tester, Let me introduce myself. 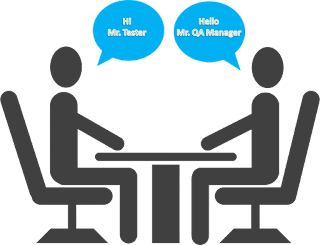 I am Mr. QA Manager. I am working here since last 5 years. I have a team of 6 Manual testers and 2 automation engineers. We are now looking to expand our team and lately we are trying to hire a performance engineer. Your resume showed you are well versed with performance testing and you have listed different tools that you are using in your current organization. We will come to that later, but first I really want to hear your introduction from you. So can you please tell me briefly about yourself? Candidate: Sure sir (nervously folding the hands and leaning forward a little bit). My name is Mr. Tester and I am working in the software quality assurance field since last 3 years. I graduated in 2012. I was fortunate to be given performance testing chance since very early in my career. I have done performance testing on around 10 Web applications. The user load varies from 25 users to 1 million users. I got a chance to work on difference performance testing tools in my tenure. Now I am looking for better opportunity and to expand my learning and growth. Interviewer: That's great. You mentioned user load in your answer. That is interesting. I always get confused between performance testing and load testing. Can you help me a little and highlight the difference between performance and load testing. Candidate: (With a confident voice). That is very easy sir. In performance testing, we test about non-functional aspects like speed and like like ... scalability and ....stability. We test about…mmm response times, throughput and resource utilization levels that should meet the performance objectives of our application. You can say that performance testing is the superset of all other subcategories of performance-related testing. Load testing is the subcategory of performance testing. In Load testing, we validate that when the application is subjected to expected user load, how it will behave in terms of performance. Interviewer: And what is stress testing? Candidate: Stress testing is also a subcategory of performance testing. In Stress testing, we test the application under user load which is beyond our normal and peak load expectation. Interviewer: Can you tell the difference between load testing and stress testing by giving an example? Candidate: Sure sir. For example, we want to test the performance of an e-commerce application. We were expecting that when we launch that e-commerce store, maximum around 500 users will access that website in 1 hour. We designed the website with that maximum number in mind. 500 users is the peak load condition for our website and 100 to 300 users is the normal load condition of our website. So we should test the application for at least what we are expecting. So we will use a tool and simulate 100 users, then 200 users, then 300 users up to 500 virtual users and we will validate that the response time of web pages, CPU and Memory utilization of server should be in acceptable limits at each user range. In simple words, we verify the behavior of our application under normal and peak load conditions. This is Load Testing. When we want to stress test our application, we will increase the user load to more than 500 users and we will see how our application reacts. For stress, it is not necessary to increase just the user load. We can limit the memory of server or we can make the disk space insufficient just to see that how our application reacts. Does it crash? And does it crash gracefully or not? What will be the response times of web page in these stressful conditions? Etc. Interviewer: Good example and nice answer. It seems that your concepts are clear in these terminologies. Let me ask you about some more terminologies of performance testing. Tell me about endurance testing and spike testing. Candidate: Endurance testing is the subset of Load Testing. When we put our application under normal and peak conditions over an extended period of time it becomes endurance testing. Spike testing is the subset of Stress Testing. When we repeatedly put stress on our application for short period of time, it becomes spike testing. Interviewer: Great. What about capacity testing? Candidate: Capacity testing is done in conjunction with capacity planning. With capacity testing, we determine the ultimate breaking point of the application. With capacity planning we plan by knowing how much additional resources (such as memory, processing power) are necessary to support that much load. Capacity testing helps us to determine a scaling strategy as to whether we should scale up or scale out. Interviewer: What is the difference between scale-up and scale-out? Candidate: Scale up is also knows as vertical scaling in which we add more resources to the single server such as more RAM and more CPU power etc. When we scale out, it means we add another server and we make our environment distributed. Now the load will be distributed to 2 machines. Scaling out is also called horizontal scaling. Note: Please give your feedback and other interview questions for which you wish to see the answers here. You may know me very well. 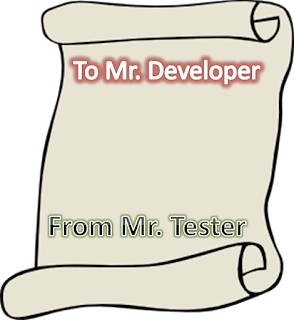 I am Mr. Tester. I know you don't like me much and I can understand that. You create something and I normally point out defects in your creation. It is natural to not feel good about that. I am not here to convince you to like me. I am not discussing either about Tester vs. Developer debate here. It has been discussed time and again and I know you get that point and you now treat me as a fellow and partner and not an enemy. And.... thank you for that. I treat you as my partner as well. I am writing this letter for something else. I know you are very knowledgeable and what I am about to tell you, you probably heard it many times as well. So I probably will not increase your knowledge. There are 2 types of testing. When I was a fresh graduate, I was told Black Box testing was done by Testers and White Box was done by ....ahem ahem ...Developers. Let me rephrase testing types again for you. There are two types of testing. Testing from the code side and Testing from the user side. We, as testers take care of the user side of the testing. There are many stakeholders in the project and each one, to some extent, tests the application from the user side. No other stakeholder will test from the code side except for one which is you. The Developer. Everybody assumes (and rightly assumes) that unit testing will be done by you. Not every developer ignores Testing from the Code Side. I found out that this testing is routinely done by other developers in big organizations like Google, Microsoft and Facebook. You can object that these are big organizations and their developers can do it. But even developers who develop open source software, they are doing it. Jacob Kaplan-Moss, one of Django’s original developers, says “Code without tests is broken by design." So then why you are not doing it? So let me state some benefits of Unit Testing for you. Tests will save you time. Your first objection on not doing unit testing can be the lack of time. You have so many features to develop, tasks to do and bugs to fix. Adding another weight of writing unit tests may seem time-consuming. But, in reality, Tests will save you time. You develop sophisticated applications. (Yeah) You might have dozens of complex interactions between components. A change in any of those components could have unexpected consequences (read bugs) on the application's behavior. If a problem occurs, you will spend hours manually trying to identify the cause. Tests will just not identify the problem, they will prevent them. The presence of unit tests makes sure that any new change does not bring any regression to existing code. If any test case fails, you can know before release that where the actual problem lies. Bugs which are found earlier in the process are lot easier to fix. Also, it gives confidence that major functionalities are still working after new changes. When you develop a feature and write unit tests for it, you will feel a lot more confidence about this feature because you know that this feature will not break in the future due to other code changes. Tests will make your code more maintainable. When you begin to write tests, you will feel that much of your code is not testable at a unit level. This will force to break the existing functions into smaller functions which are more modular and generalized in nature. This automatically makes your code more maintainable. Tests help teams code together seamlessly. The previous points are written from the point of view of a single developer maintaining an application. Complex applications will be maintained by teams. Tests guarantee that colleagues don’t inadvertently break your code (and that you don’t break theirs without knowing). By now you must have been convinced that you should write unit tests. But I will not stop there. I would like you to show some strategies to start doing unit testing right now. After all, I am your friend Right? 1. Sometimes it’s difficult to figure out where to get started with writing tests. If you have already written several thousand lines of code, choosing something to test might not be easy. In such a case, it’s fruitful to write your first test the next time you make a change, either when you add a new feature or fix a bug. 2. Some programmers follow a discipline called “test-driven development”; they actually write their tests before they write their code. But if you are not comfortable with that, you can code first and then write tests for it later. 3. It might seem that your tests will grow out of control. At this rate there will soon be more code in your tests than in your application. Let them grow. For the most part, you can write a test once and then forget about it. It will continue performing its useful function as you continue to develop your program. At worst, as you continue developing, you might find that you have some tests that are now redundant. Even that’s not a problem; in testing redundancy is a good thing. A separate TestClass for each module. 5. Sometimes tests will need to be updated. In that case, many of our existing tests will fail - telling us exactly which tests need to be corrected to bring them up to date, so to that extent, tests help look after themselves. Mr. Developer, I respect your work. The above is a friendly suggestion. This suggestion will not only benefit your organization but will also make you a better developer. After all, quality is not just a list of features, it is an attitude. I hope you will not take this letter as an offense on your development practice. Take it as a brotherly suggestion, given out in the love of quality. Thanks for reading this letter. If this letter can convince only 1 developer to start unit testing, I think the purpose will be fulfilled. 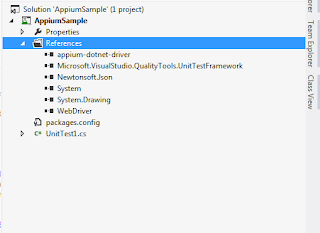 This is the second part of the series "Test automation on Android using Appium, C# and MSTest". If you missed the first part, Click here. Now it is time to code. Create a unit Test project. Your reference section should look like this. In your [TestInitialize] section, write this code. The complete code should look like this. 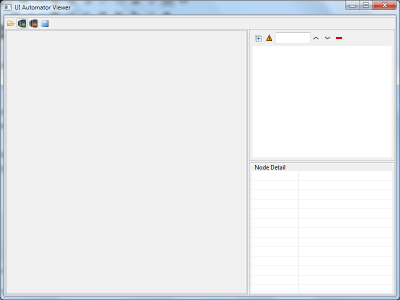 To run this test case, click on Test Menu > Windows > Test Explorer. A window will open on your left and it will list down the test cases. Select your desired test case and click run. 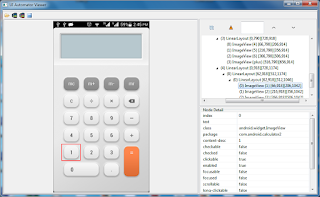 Now watch your android phone, A calculator window will open on your android phone, button 2 will be tapped, then button + , then button 4 and then button =. After that result will show 6 and your test case should ideally be passed. 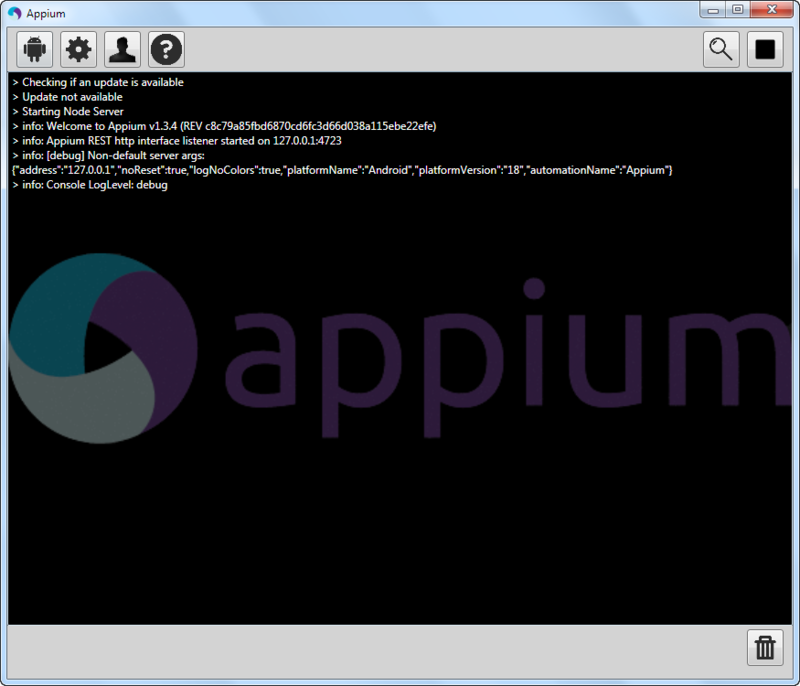 Make sure your Appium server is running. 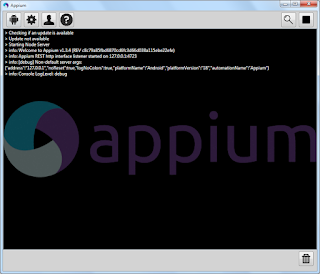 Appium window will show you all the logs. Congratulations, you have just written your first automated test case in Appium and it is running on a real android device. Most of the code is self explanatory. But I want your attention on these two lines. For every application you want to test, you must know its package name and app activity name. So to know about these attributes, you need to download a little android app on your phone. It is called apkInfo. 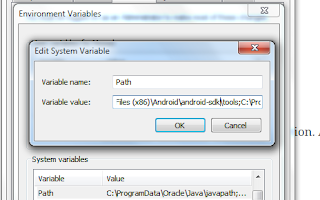 It will show you the package name and activityname of any android app installed on your phone. Just pass these parameters here and that app will launch on your phone by automation code. 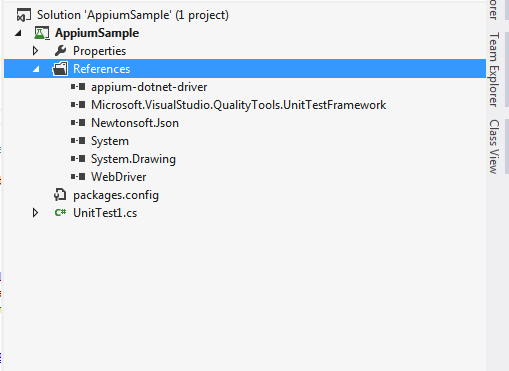 This is a two part series of test automation on android using Appium, C# and MSTest. A USB Cable to attach your Android Phone to Your PC. 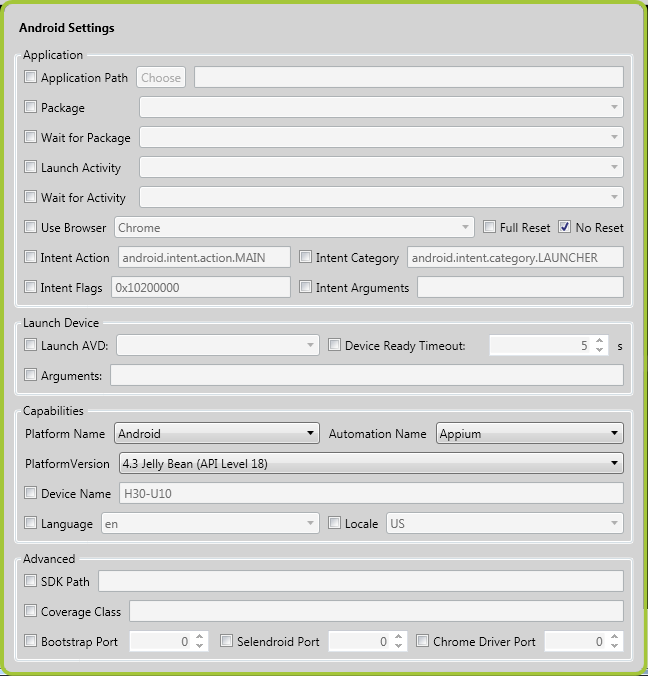 When you have installed Android SDK, go to My Computer, right click , click Properties, click Advanced System Settings, click Environment Variables. 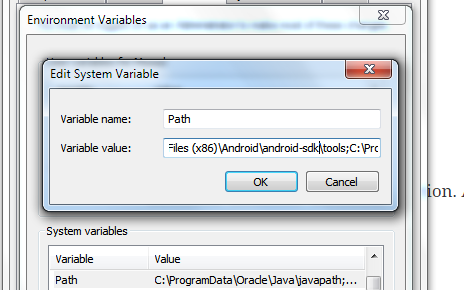 Edit the PATH variable in "System Variable" Section. Append the path to your tools folder and platform-tools folder. Separated with ";"
Connect your Android Phone with USB Cable. To make sure your android phone is connected with your PC, we have to do following. Go to C:Program Files (x86)Androidandroid-sdktools. Click on "uiautomatorviewer.bat". A window will open. See Image. You can use this window to inspect the elements of your app in android. 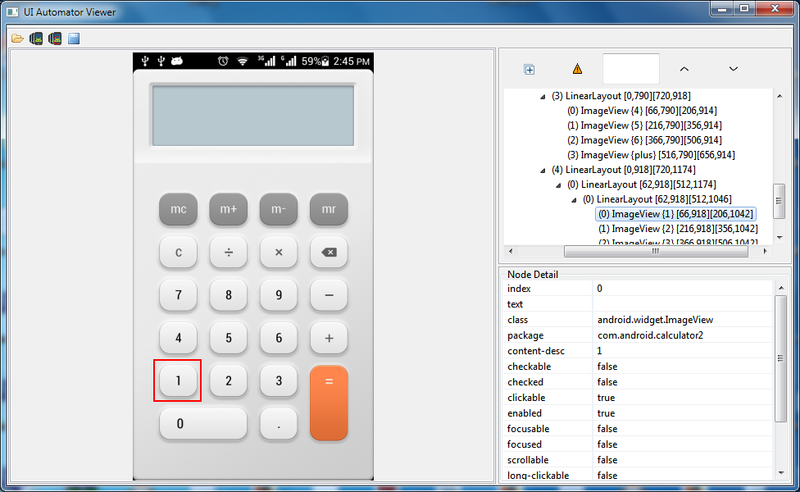 Open the calculator app in your android device and click on "Device ScreenShot" button on this screen. 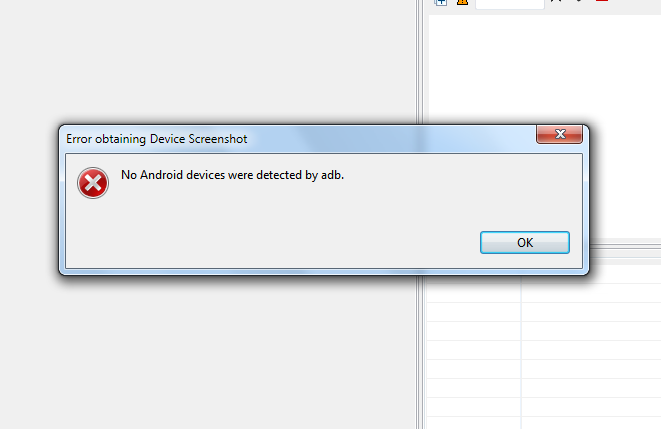 If you receive this error message "No Android devices were found by adb"
That means adb interface drivers are not installed on your system. You have to read again point number 6 in the Prerequisites section. 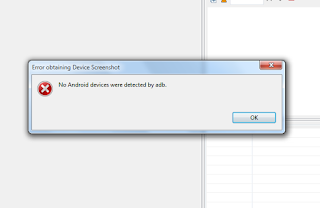 If android device is successfully connected, you should see a snapshot along with Object Map in this window like this. Unzip AppiumforWindows.zip in a folder. 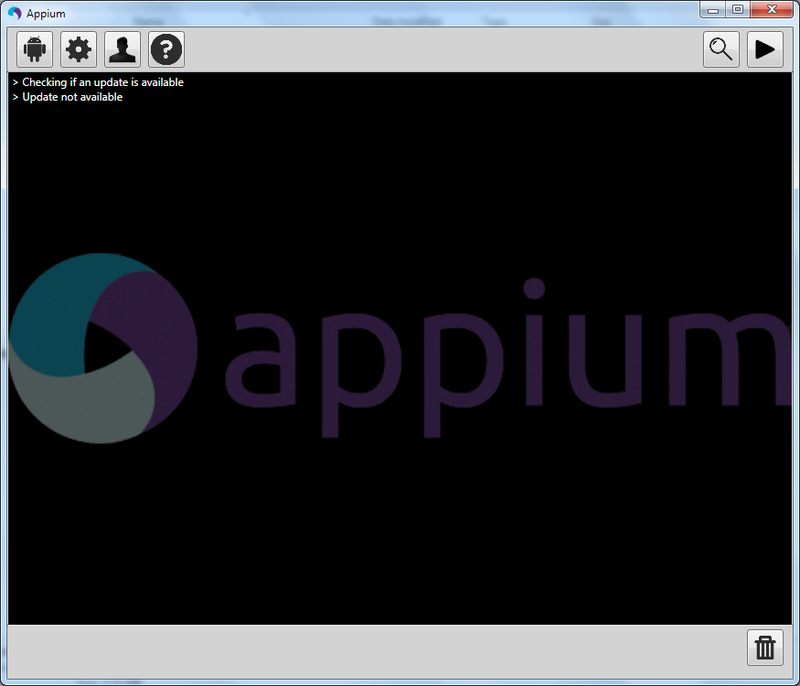 Open Appium.exe, you should see a window like this. Click on the android Icon on the top left of this window. 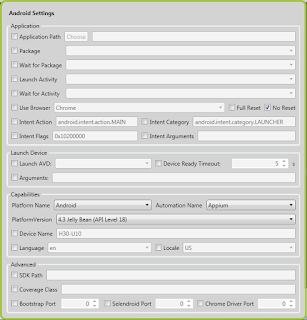 You will see a window in which you can configure the platform and version of your android on which you want to test. I have filled the following configurations there. Now click on the Play button on the top right corner of the window. 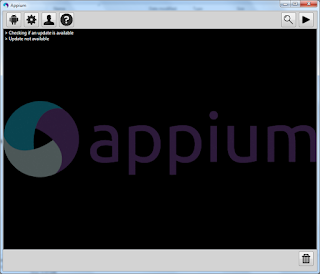 Appium server will start with the configurations you have provided. Developer options should be enabled on your android phone, with these two options. Usb Debugging should be enabled. If you reach till here, Congratulations, You have successfully configured all the required prerequisites . 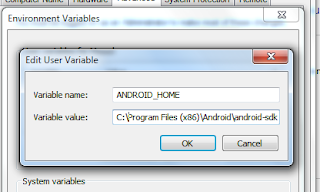 In the second part, I will show how to code and run this script on your real android device. This post is a collection of JMeter Tutorials from the web. JMeter is a leading open source load testing tool which is widely used across the globe. When I first tried to use JMeter, I feel that it involves a learning curve. The resources and tutorials are abundant on the internet but scattered. That is where I decided to create a JMeter Tutorials resource list for newbies which they can go through. After the success of Selenium in Java resource list, It only feels logical that such resource lists are needed very much. Below are some very useful links for JMeter Tutorials. Please go through them and bookmark those which you find beneficial. This blog contains only 4 to 5 posts related to JMeter. But these posts are so beautifully designed especially the conceptual post about How Apache JMeter simulates multiple users that they have nailed it. They have cleared many concepts with this single post using simple diagrams. I urge everyone to read this post first before going on to detailed JMeter tutorials. Guru99.com was also featured in my Selenium Resource List. They are again featured on this list. Thier tutorials are simple and easy to understand as always. They have covered extensively from Introduction to Jmeter to JMeter interview questions. These will give you a start. BlazeMeter is a commercial, self-service load testing platform-as-a-service (PaaS), which is fully compatible with Apache JMeter. BlazeMeter provides an enterprise grade, ‘out-of-the-box’ load testing solution for the developer community. Although the company is commercial, they have created this free resource list for the community. They have many great links on that resource list but the highlight is their free 5-Day JMeter Course. You have to register to get these videos delivered to your inbox. If a commercial company is giving away free resources on an open source tool, do you think that open source community will be behind in sharing their resource list? You are wrong. See this list on Github, it is created by Aliaksandr Belik and it is quickly grown into a mighty resource list covering everything from Books to Blogs and Tutorials to Tips and Tricks. A must have bookmark for every JMeter enthusiast out there. The most comprehensive Manual for JMeter created by the creators of JMeter. It is comprehensive but I would suggest to only look at this after going through the above 5 links. Then it will make sense to you. Don't forget to check the JMeter plugins page. These plugins make JMeter much more powerful. Free articles and videos on JMeter. This website has tutorials for many other automation tools as well. Karthik works really hard in setting up this website and constantly post videos on that on new tools. This blog crossed 1.4 Million views as of now. The good thing about these tutorials that they start from basics of performance testing. I found them simple and easy to understand. I hope you conclude the same after visiting this link. This guy has written more than 50 posts on JMeter and still more articles are coming soon. He knows what he writes. This link is the collection of the posts he has written on JMeter. He also writes about Selenium, Design Patterns and other stuff on this blog. Great collection of articles. Last but not the least. A complete JMeter course on Udemy is also present. Which is not free of course. But if you are willing to pay some bucks you will get all things at one place along with help from a teacher. Currently this course holds a 4.3 rating. Read the reviews and decide for yourself. This list is obviously incomplete without your contribution. Please send me links to blogs/websites which you found useful while learning about JMeter and I will include them here. Thanks for reading :) Waiting for your feedback and comments. For all those who want to learn Selenium in Java, I have searched and compiled all those resources which I personally found useful. Please go through these links and bookmark those which you find beneficial and useful. A picture is worth a thousand words and I think a video is worth ten thousand words. This free course by Raman Arora is especially very useful because he focuses on Java basics first. Then he moves towards Selenium Concepts, the basic difference between Selenium IDE, RC and WebDriver. He also touched concepts about Selenium Grid, SVN and DataDriven Framework. Nice course for those who are unfamiliar with Java and wants to brush up their skills first in Java. A beautifully designed Website with carefully crafted tutorials. ToolSQA is not limited to Selenium Tutorials only. It has extensive tutorials on other automation tools as well such as Cucumber, SpecFlow and Appium etc. The good thing about this website is that tutorials are arranged in an order so that a newbie always has a clue as to start from where and where this will lead to. A great website for automation enthusiasts. Amazing tutorials with great illustrations. Their vision is Fun & Free Education for ALL. Like ToolSQA, it has tutorials for other automation tools as well. Another good thing about this website it that it has links to live projects where you can brush up your selenium skills by practicing on them. 33 articles on this topic and counting. SoftwareTestinghelp.com is a household name for software testers in India and Pakistan. These tutorials are comprehensive and enough for you to get started on the Selenium Journey. Shruti Shrivastava, Amaresh Dhal, and Pallavi Sharma have created this tutorial for all of you. They are also offering live training which is paid. A website developed by Alan Richardson. The author of the book Selenium Simplified and a Trainer of Selenium. This website contains great articles on Selenium with Java. The highlight of this website is the "speedruns", which is basically a checklist or a quick through to configure the environment for Selenium. A bit scattered but contains many useful articles. This blog covers from java basics to Advanced Selenium Concepts. Design is not great but information is pretty useful. This blog covers some advanced scenarios for selenium webdriver like integration with SauceLabs and Keyword Driven Framework. If you are willing to pay some money for your learning, I cannot force you enough to take this course online on udemy.com by Alan Richardson. This course has 4.9 rating on Udemy. and it only cost $299. Sometimes udemy.com announces discounts on courses, you can wait for that as well. The benefit is that it will cover almost all the topics under one roof. Another live course on SoftwareTestingHelp.com. This link contains their training schedule and fee structure. All video lectures are recorded and sent to you afterwards in case if you miss any class. Selenium Recipes in Java (Ebook) by Zhimin Zhan. The Selenium WebDriver Recipes book is a quick problem-solving guide to automated testing web applications with Selenium WebDriver. It contains hundreds of solutions to real-world problems, with clear explanations and ready-to-run test scripts you can use in your own projects. You can also download free sample to see what it contains. There are also many books present on Amazon.com, LeanPub.com and packtpub.com. Since I have not read many of those, I really like some feedback through comments so that I can include some more names in the list. If you own a blog and you write about this topic "Selenium in Java" and you want your blog to be included in this list, please email me on joinsaad@gmail.com. I hope this list is beneficial for all of you. Please send your feedback. Thanks for reading. When automating a web application, the most important and time taking task is to come up with unique locators for the elements present on the web page. Once you find out the correct locator, the rest of the automation is relatively easier. Finding correct and unique locators require human intelligence and below tools can help you in a great deal when you start creating your scripts. Every automation engineer should have these tools in their arsenal. This tool is simple, provide any XPath or CSS selector and it will highlight the matching elements on the web. Simple, lightweight and easy to use. Install it on top of Firebug. Right Click on any element and select "Inspect in Firepath", this addon will generate the XPath or CSS selector for you. It also highlights the element on the web page and in the DOM. Very useful. Again install it on top of Firebug. This addon will generate XPath for any given element. 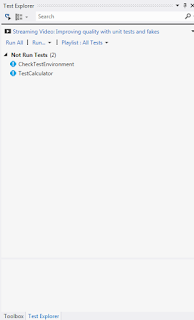 But the best thing is, it will also generate WebDriver statements for you and also in the language of your choice. Currently, it supports C#, Java, Python and Ruby. Just right-click on any element and generate the code in your favourite language. It is that simple. The only downside is that it only generates XPath. Sometimes XPath and CSS Selectors do not work in a given situation. That's where JQuery selector comes in handy. This is a bookmarklet created by Jessie A. Morris and it will generate the jQuery selector for your on the clicked element. Go to this link and drag the provided bookmarklet to your bookmarks bar. The button will appear with the name Selector Detector. Now click on it and Click on any element and it will generate the jQuery selector for you. This tool is created by Andrew Cantino and Kyle Maxwell. It can generate CSS Selectors for you. Authors describe the method to generate CSS selector like this. Click on a page element that you would like your selector to match (it will turn green). SelectorGadget will then generate a minimal CSS selector for that element, and will highlight (yellow) everything that is matched by the selector. Now click on a highlighted element to remove it from the selector (red), or click on an unhighlighted element to add it to the selector. Through this process of selection and rejection, SelectorGadget helps you come up with the Perfect CSS selector for your needs. See the video on the provided link to better understand this tool. This is a comprehensive tool and it is more than just a generator. It is developed by Dmitry Zhariy. Using this tool, you can generate selectors as well as full classes for your code in Selenium WebDriver. It allows you to generate Page Object Models for your automation code. If you are a C# developer, this tool will save you ample amount of time. The best thing about this tool that you can write C# code in this tool and see the live results on the browser. That is amazing. Although not as comprehensive as SWD Page Recorder, This tool is still useful in finding elements. It also allows you to write groovy scripts and see the results live on the browser. Good for Java developers. These were some of the tools to identify locators easily. I hope the above list helps the automation engineers in saving their time to identify and verify element locators. I am also working on an application inspired by Looking Glass and SWD page recorder. 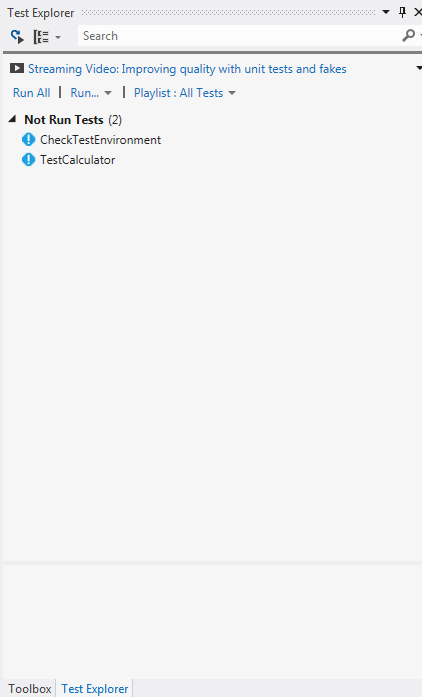 It will allow you to verify your locators and generate C# classes for you. I am calling it "SeleniumVerify". It is present on GitHub. Currently it is under development and I will soon update you when it is ready for download. Do you happen to know any other tools. Please share in comment and also give your feedback on this article. One of the great features of Selenium WebDriver is Cross browser testing. It allows you to create single test case which can execute across different browsers. That means you write one test case to test one functionality and you can run this test case on all of your supported browsers. Selenium supports Firefox, Chrome, IE, Opera and Safari. It also supports headless browsers like HTML Unit Driver and PhantomJS. This article will tell the approach to write scripts in such a way that is supports execution on IE, Chrome and FireFox. You can of course further enhance it to fit your needs. The code is self explanatory. You will pass the browser name and it will give you the instance of that particular browser. That's it. Before executing any script, you just have to change the browser name in you app.config file. Your tests will will start executing on that particular browser. See this sample test method. This test case can run all three browsers without changing anything in the code. Thanks for reading this article. Feel free to share your feedback. There are many instances when you click on a link and it opens a new window or tab. Selenim WebDriver provides a way to switch to that new window using SwitchTo() method. //perform some action to open a new window. Like clicking a link. Sometimes we want to make sure that we have used a right locator to identify an element. For this purpose, we can highlight that element before applying any operation on that. In this way, we will be sure that we are targeting a right element. we can go one step further and make it a function. Please note that above is an extension method. So this function will be available across every instance of webdriver. To use this function in our code, we can use it like this with any webdriver instance. I hope this post helps you in automating your web application. Please do leave your feedback in comments section. CSS selectors are a great and fast way to locate elements in Selenium WebDriver. I have listed down some basic CSS Selectors for Selenium WebDriver which are commonly used. The goal of this tutorial is to explain as simply as possible about various types of usages of CSS Selectors using simple examples. This HTML contains a text box , button and an anchor with various attributes. You can select an element by using any attribute. There are three ways you can match the pattern in any attribute. 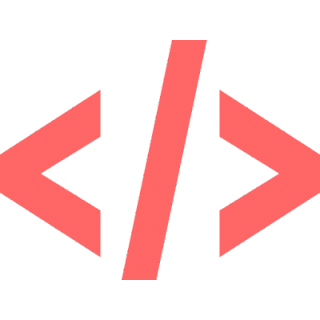 In CSS Selector, Starts with is denoted by ^ symbol. In CSS Selector, Ends with is denoted by $ symbol. In CSS Selector, Contains is denoted by * symbol. The above HTML contains our beloved text box, button and anchor again. But this time inside a parent element. The above HTML now contains two divs. If we want to select a child element using indirect child method, it will return us more than one occurrence of child. div#parentdiv input.txtclass (This will return two text boxes with class "txtclass". As both these text boxes are the children of "parentDiv". One is the direct child and one is indirect child. Now if we want to access the direct child, we should use ">" symbol instead of space. By using above CSS Selectors, we can identify almost every type of complex web elements. I hope this tutorial helps many automation testers.